Congressman Dennis Rehberg again turned to his trusted talking points, telling Montana businesses (yesterday) what they want to hear. But Rehberg’s record as a 11-year Congressman tells a much different story. In a speech to the Montana Chamber of Commerce, Rehberg said businesses need more certainty and fewer regulations. Yet less than a month ago, Rehberg voted for more uncertainty when he voted against a payroll tax extension and against the Keystone XL Pipeline. Rehberg criticized regulations that hurt small businesses, but in 2010, he voted against the Food Safety Modernization Act. Senator Jon Tester, a Montana farmer, successfully amended the law to ensure that family farmers and food producers were protected from federal regulations they don’t need and can’t afford. During his 11 years in Congress, Rehberg has given himself FIVE pay raises while voting to raise the debt ceiling TEN times. 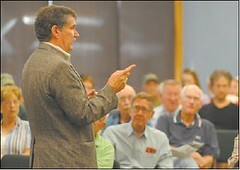 In December 2010, Rehberg voted for the largest tax increase in history on Montana families and businesses. This entry was posted in Montana, politics and tagged Congress, Denny Rehberg, Jon Tester, millionaire, millionaire congressman, Montana, Montana Democratic Party, pay raise, taxes, Tea Party Caucus. ← Greg Louganis: Dancing With The Stars?